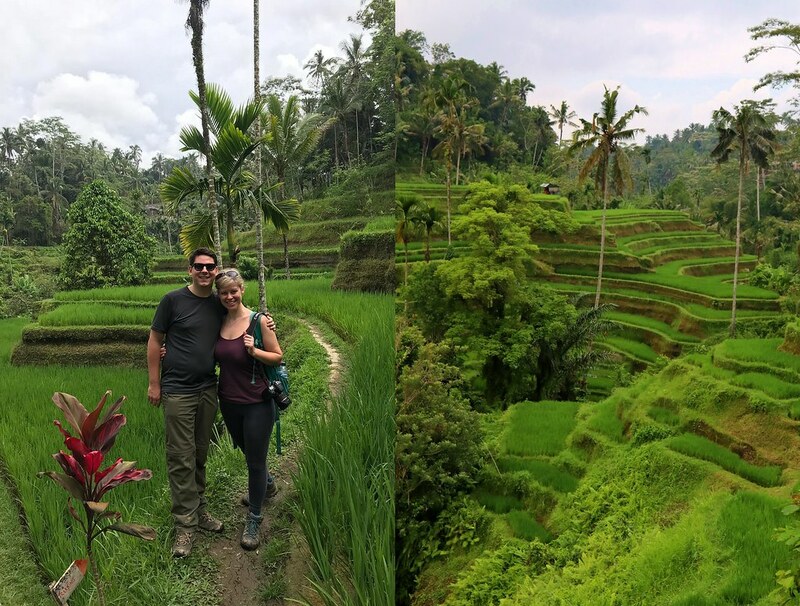 At the end of last year, I visited Indonesia with my partner, Pete, and we had a wonderful fortnight exploring some of the different islands. 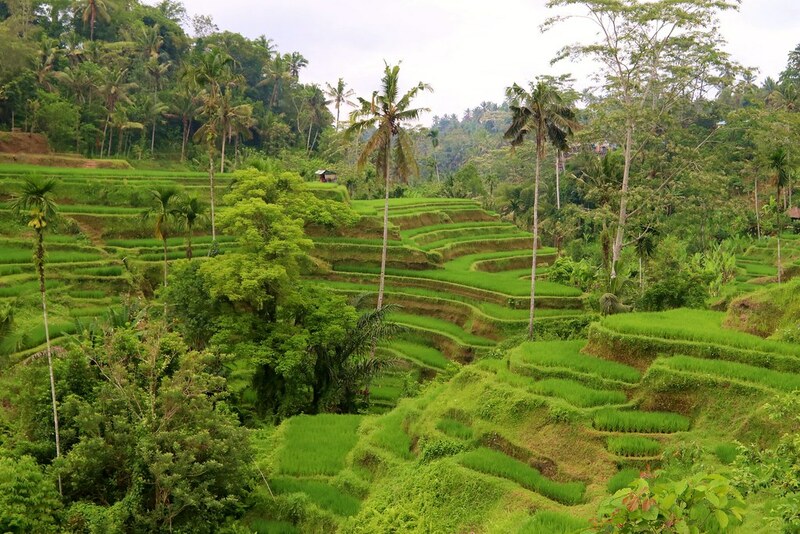 I had read about the rice terraces in Bali before our trip, and never having been to one before, I was keen to go and drink in the view. 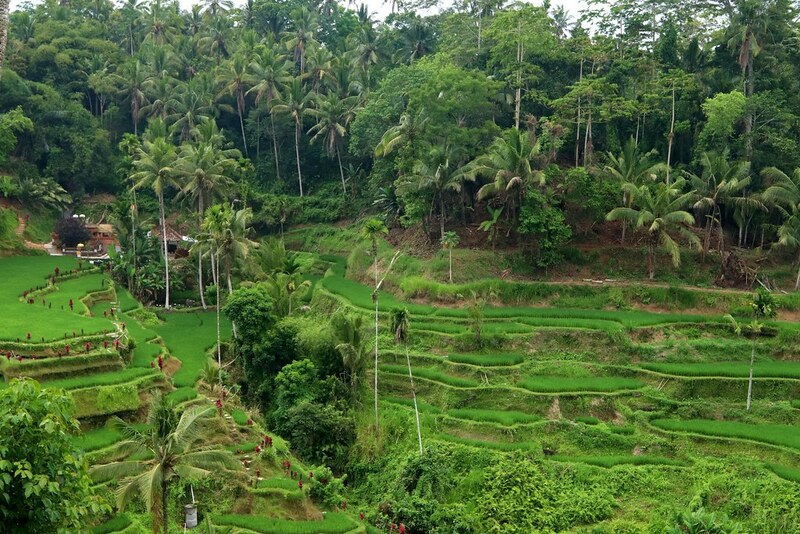 Today's blog post is all about our visit to the Tegallalang Rive Terraces. 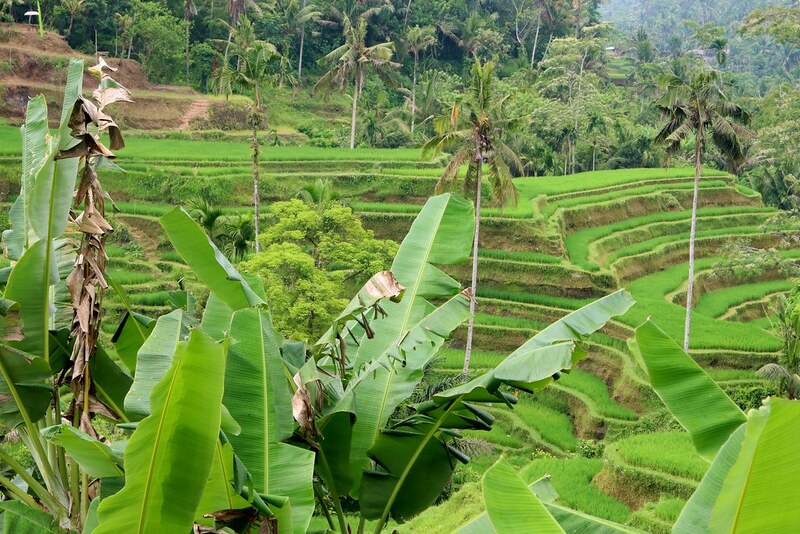 You can read about some of our other experiences in Indonesia here: Indonesian Adventures. 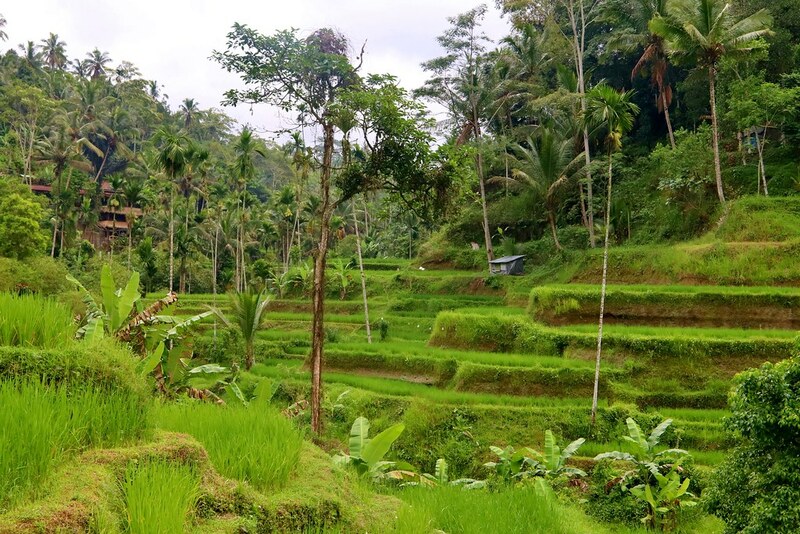 Our next stop was the Tegallalang Rice Terrace; at almost an hour’s drive away I found it very hard to stay awake and my eyelids kept drooping. But as we got close, the landscape was such a vivid green and the sun was shining so brightly that I started to pay more attention to the surroundings. We arrived at the famous terraced fields, made a voluntary compulsory donation towards the upkeep and wandered inside, our driver showing us the way. It was incredibly quiet; I had thought there would be loads of people but there were only one or two other tourists besides us. And it was spectacular. 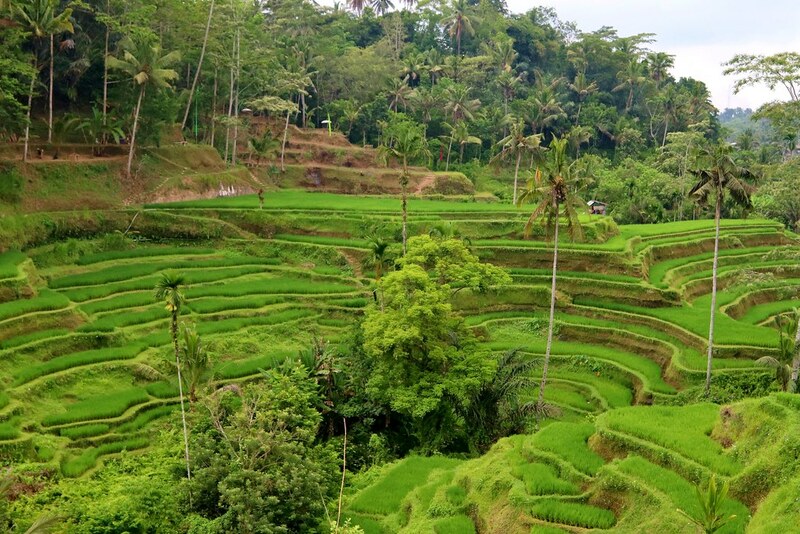 The terraces are cut into the sides of a valley and every inch of space is flooded with lush, vivid, green stems of rice. 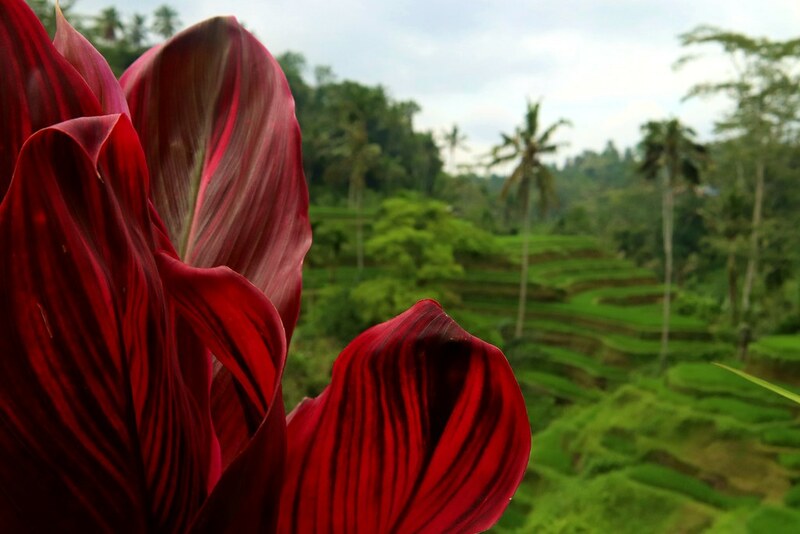 Each terrace was dotted with red plants with big, waxy leaves, providing a pop of contrast to the landscape. It was undeniably peaceful, with a faint trickle of water sounding as the irrigation system worked its magic. We climbed down the terraces, finding our footing on rough stairs and stepping stones, right into the bottom of the valley. 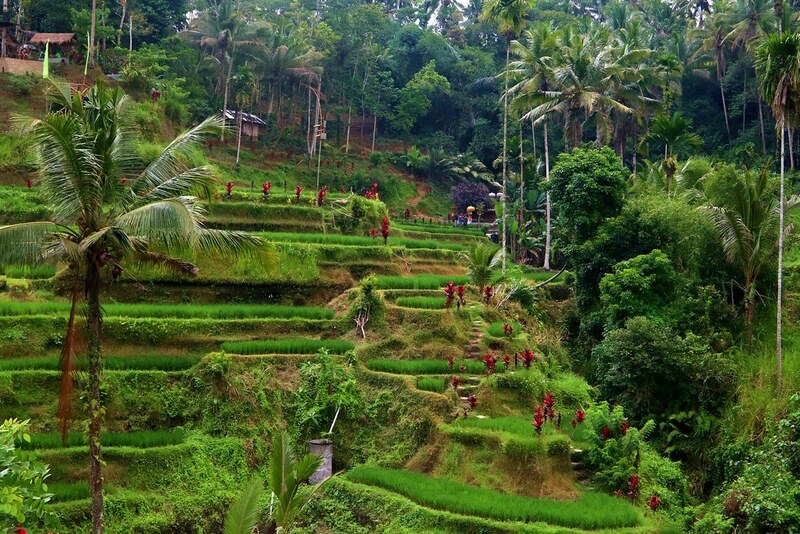 Layer upon layer of crops rolled up and away back into the hillside and all was calm and quiet. We climbed back up the other side to see the view the other way, meeting the occasional worker carrying baskets over the shoulders. But mostly it was hushed and empty, almost sleepy. 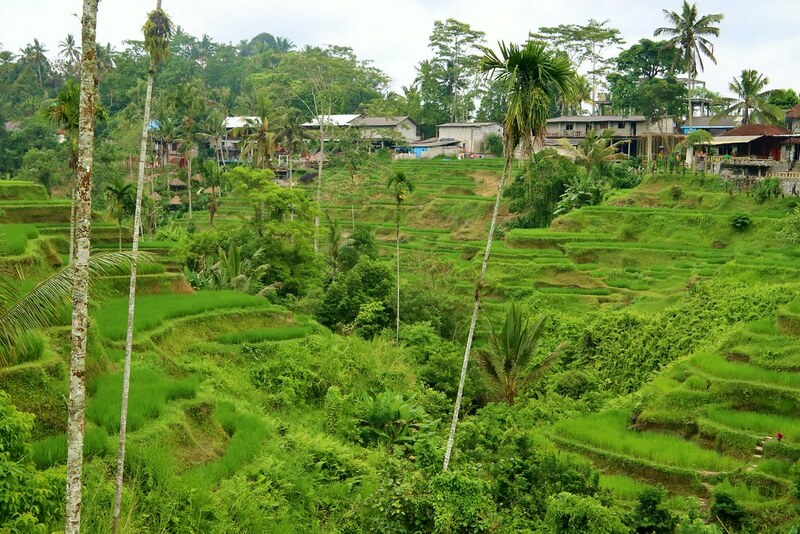 I loved being able to visit Tegallalang; it was a view I had been pretty keen to see and it really was a lovely vista. The land really seemed to be working in harmony with the agriculture and it’s almost strange to think of something so practical being so beautiful. With my fill of photos finally shot, it was time to head back to our villa. It had been a long day, naturally, and the clock had progressed to the somewhat advanced our of ten. In the morning. Pete noted how much we could get done if we only got up very early every morning. I have not finished mocking him for this sentiment yet. We were pretty sweaty and gross from our hike so we showered and then lay down just for two minutes to relax in the perfectly air conditioned bedroom. It was sooooo relaxing and comfy. And two minutes soon became a couple of hours. Time for lunch! We ordered some food and sure enough, our cat reappeared with its arrival, meowing continuously. She invited herself not only into our garden but into our living room. Which wasn’t a problem until she started jumping on the table and refusing to understand that no means no, no matter how adorable you think you are. I put her outside. Or, more accurately, it took me and Pete working together to get her to go outside long enough to shut the door. She sat outside the glass meowing at her in protest. But she did eat the prawn cracker Pete gave her. We passed a pretty quiet afternoon very pleasantly with some reading, some journaling, the odd video and podcast and a spot of swimming. Once the evening got a little cooler, we sat outside on our loungers by the pool and the sun sank lower as dusk gathered. Our frog chorus started up which was pretty comical; they made the most fantastically ridiculous sounds. 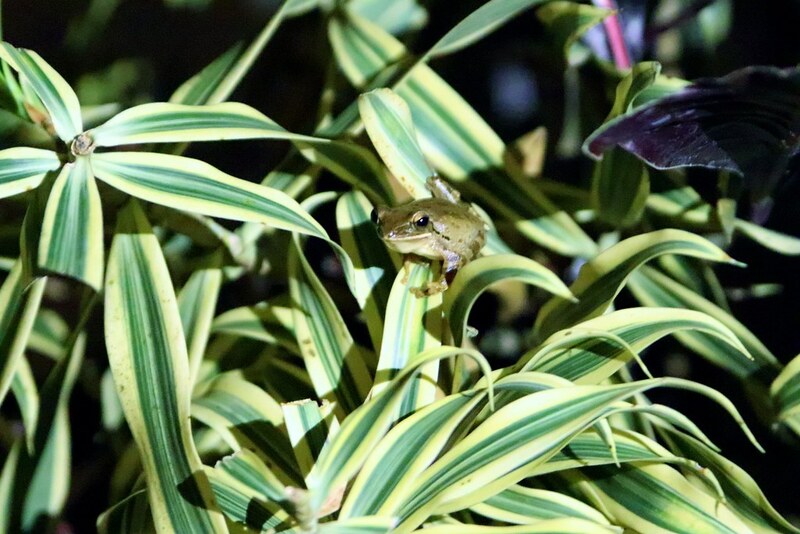 Pete swore he could hear one in the tree to his right and, hunting around with the light from my phone, he did indeed spot the little chap sitting at eye level on one of the plant’s leaves. 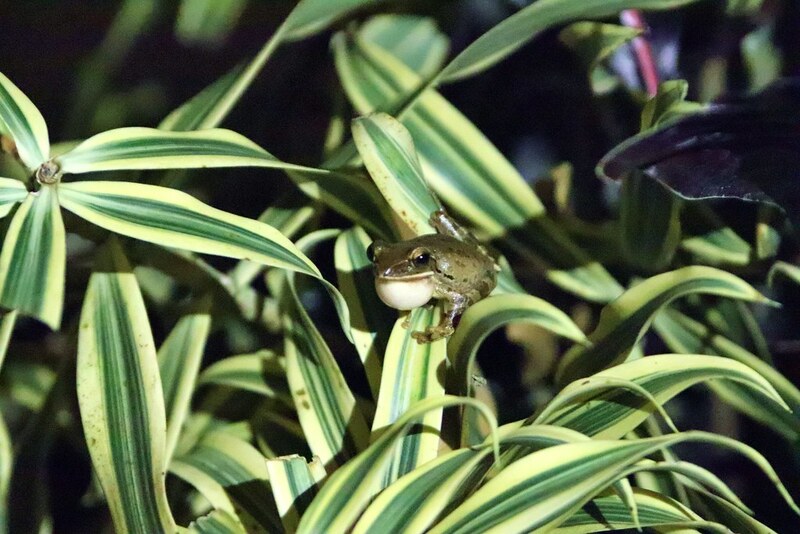 He didn’t seem to mind an audience, periodically inflating his throat to croak at another frog, hiding in the foliage somewhere near the pool. We ordered another round of food for dinner, watching a couple of episodes of Atypical and then rounded off the evening with a bit of a night swim. Purely to keep the frogs company. It felt chillier as the air was cooler and I had a quick, warming shower afterwards. An early, lazy bedtime followed, with a bit of telly as we lounged and relaxed gradually into sleep, safe in the knowledge that the next day held a lie in.